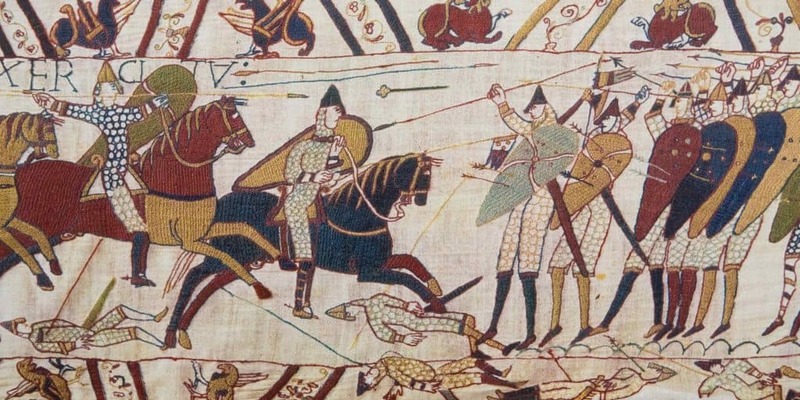 The Norman Conquest is amongst the most scrutinised events in English history and many may feel that there is little new that can be said about it. But the year 2013 marks the 1,000-year anniversary of the birth of an oft-ignored Welsh leader whose career played a crucial role in forging the Britain of 1066, with all the political flaws that William the Conqueror was able to exploit. His name was Gruffudd ap Llywelyn and he was the last, and the most formidable, King of Wales. Having emerged as king of North Wales in 1039 he waged a bloody war to conquer the south-west of the country, while consistently pursuing a policy of aggression and expansion on his eastern border with England. By the 1050s, only the obdurately independent sub-kingdom of Glamorgan in south-east Wales lay outside his control, an area controlled by one of its most powerful leaders, Gruffudd ap Rhydderch. But the reign of Gruffudd ap Llywelyn should never be simply viewed within a Welsh context. In his rise to power he had needed to master formidable sea raiders from Ireland, the western isles and Scandinavia. Soon after he became king in 1039, Gruffudd won a major victory against the forces of Anglo-Saxon Mercia at the Battle of Rhyd-y-groes (near Montgomery and Welshpool). In 1047 he allied with Earl Swegn Godwinesson to subdue his rivals in south-west Wales, and a devastating attack made by Gruffudd on northern Herefordshire in 1052 may have been in support of Swegn, who had been exiled by Edward the Confessor along with the rest of the Godwine clan. Gruffudd had already demonstrated his ability to handle Viking raiders, the vulnerability of England’s border defences and the potential gains to be won by exploiting the splits in the Anglo-Saxon political world. In 1055 he would bring all of these elements together to stunning effect. With Swegn dead and a hostile new earl, the Norman Ralf, on his border in Herefordshire, Gruffudd would turn to a most unlikely source as a new ally. The leaders of Mercia were the historic enemies of Wales and in 1039 Earl Leofric had seen his brother, Edwin, killed by Gruffudd at Rhyd-y-groes. But the relentless rise of the Godwine family in England after 1052 saw traditional enmities put aside for the formation of a strong and lasting alliance between Leofric’s son, Ælfgar, and Gruffudd. In 1055 Tostig Godwinesson was made the new earl of Northumbria, and soon afterwards Ælfgar, the earl of East Anglia, was exiled for ‘treason’. In his rivalry with the house of Godwine, Ælfgar, who was destined to succeed his ageing father in Mercia, sought to build up a western power bloc, putting aside any previous difficulties that his family had experienced with the Welsh king in order to secure a powerful new ally. The significance of Gruffudd’s search for a strong confederate amongst the Anglo-Saxon nobility would become clearer as his ambitions for territorial expansion were revealed. The Welsh king was eyeing the rich lowlands of his eastern border, territories with surviving people amongst their populations who regarded themselves as Welsh in terms of language, custom and law. The Welsh had been fighting a rearguard action for control of such land for centuries, with the Anglo-Saxon rulers of Mercia their main enemies. Gruffudd would now reverse this trend and secure Mercia as the bulwark to protect his vulnerable conquests from the direct power of the Anglo-Saxon state. After his exile, Ælfgar headed to Ireland where he recruited a mercenary fleet. Gruffudd, meanwhile, gathered a huge army and marched to a pre-ordained meeting point with Ælfgar near the mouth of the River Wye. This was the heartland of Gruffudd ap Rhydderch’s domain, and the latter was killed by his northern rival and namesake, Gruffudd ap Llywelyn thereby becoming the only man to unite and rule all the lands that comprise modern Wales. Gruffudd and Ælfgar led their forces up the River Wye, crushing Earl Ralf’s defending army outside Hereford before burning the city. Harold Godwinesson was sent to restore order, and when peace was agreed Ælfgar was returned to his lands while Edward the Confessor recognised Gruffudd’s land conquests along the entire length of the England-Wales border. The uneasy peace was rocked in 1057 when the death of Earl Ralf saw Harold gaining Herefordshire. Earl Leofric died in the same year and was succeeded in Mercia by Ælfgar, but much of the latter’s old East Anglia earldom went to the Godwines. To compensate, Ælfgar moved to strengthen his western alliance, and his sister, Ealdgyth, was married to Gruffudd. The close ties proved invaluable in 1058 when Ælfgar was again exiled, and he again turned to Gruffudd. They allied with a formidable Viking fleet under the control of Magnus, the son of Harold Hardrada, the king of Norway. Ælfgar was soon returned to power, while the studied obscurity of the Anglo-Saxon sources seems to suggest their shame and the buying off of the Welsh and Norwegian invaders. The years had been tumultuous, but a political balance had emerged in southern Britain. Ælfgar’s Mercia and Gruffudd’s Wales were a match for the power of the Godwines, a situation that had been recognised by the peace treaty that Edward the Confessor had made with Gruffudd c.1056. The new stability on the England-Wales border was shown as the sees of Worcester and Hereford were left vacant in 1058 when Bishop Ealdred went on pilgrimage to Jerusalem. It is possible that Earl Harold went to Rome in the same year, while a number of prominent Anglo-Saxon nobles made the journey to the Eternal City in 1061. Had this situation been maintained when Edward died, it seems certain that Ælfgar and Gruffudd would have blocked Harold’s path to the English throne, meaning that the succession would have fallen to the last surviving male member of the ancient line of the kings of Wessex, Edgar Ætheling. The crucial event was the death of Ælfgar in late 1062. The earl had lost his eldest son, Burgheard, the previous year, meaning that he was succeeded by the inexperienced Edwin. Harold, ever the opportunist, immediately moved to shatter the Welsh-Mercian alliance, breaking the peace by launching a lightning strike against Gruffudd. With his rival off-balance, Harold cannily exploited political rivalries within Wales and – after a bitter military campaign – was rewarded with the head of the country’s last king. There are suggestions that Harold moved to heal the rifts he had created within southern Britain, notably by marrying Edwin’s sister – and Gruffudd’s widow – Ealdgyth. But his weak claims to the English crown encouraged other pretenders like Harold Hardrada and William of Normandy in 1066, while his undermining of the Mercian-Welsh alliance had weakened Edwin’s military capability. The new Mercian earl and his brother, Morcar, fought bravely in defeat against Hardrada at Fulford Gate, but there is little evidence that they did much to support the independent military efforts of Harold Godwinesson, whose actions in 1066 have the frenetic quality of a man uncertain of his support base. Even after Hastings formidable Anglo-Saxon forces remained in England, but they lacked a universally accepted leader to unite them. Harold’s destruction of the political detente of 1058-62 had led to disaster for the proud nobility of Wales and of Anglo-Saxon England, who would soon be living under the Norman yoke. Dr Sean Davies and his brother, Dr Thomas Michael Davies, are co-authors of The Last King of Wales: Gruffudd ap Llywelyn, c.1013-63 (The History Press, August 2012). You can buy the full book here.